Churches have held coat drives for local shelters and blanket drives for African missions, but Waquoit Congregational Church in Falmouth has taken a bigger step in helping to heat up the community by becoming a 'Warming Station'. The American Red Cross encourages groups to support the community in times of disaster by sharing their facilities. Public buildings can be used as warming centers -- short-term emergency shelters opened during power outages. "Our Warming Station offers the community a place to come in to get warm, charge electronics, and have a cup a coffee," said The Rev. Ms. Nell Fields, pastor of the church. "But we are not just offering our Parish Hall; we are providing a ministry -- a way we can give back to the community as well as work withthe community." Last year, there was no warming station in the area. The community lost power for 5 days during a snowstorm and Fields had to run her car to get a little warm, as well as charge her phone and computer. She thought of the many others who had to do the same. So when Conference Minister Don Remick mentioned at a meeting that churches would make good warming stations, Fields lit up. She realized that many in the community could not afford a generator and would welcome the station. Fields approached the committees and members of the church and all thought it was a great idea. She talked to several generator companies and managed to convince one to give her the generator at cost. But the cost of the generator was not the only expense. The Parish Hall had old electrical wiring, so upgrades to panels had to be made; and both an electrician and a plumber were needed to hook up the equipment. Depending upon the size of the building and the situation, Fields suggests churches budget between $12-15,000 if they want to do something similar. 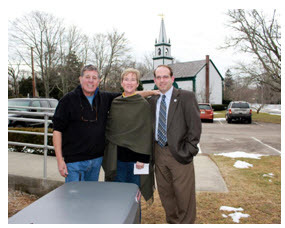 "This is a small village and I was very touched to see how different members of the community -- including a local Jewish organization, local government, and the general public -- supported the project to get the station up and running," Fields said. "Even the neighboring café put laminated flyers at each of their tables encouraging donations to the warming station ... and as a result, many people made contributions." Because of the enthusiasm of the community, the church is continuing to raise another $5-8,000 in order to install a shower and a washer/dryer in the facility. Neighbors across from the church, who are not members, have keys to the building so if the power goes out, and Fields is not at the church, they are authorized to open the doors, get the coffee going and bring the puzzles out. The generator has a self-automated check each week to ensure it can be up and running when put to the task. Fields will open the warming station whenever the power goes out, whether it's during a snowstorm, hurricane, or heat wave. State Rep. David Vieira keeping warm in Waquoit. When the station was finished, the church held a 'Grand Opening" and invited the neighborhood via flyers and local news articles. Falmouth has many retirees in the area and many of the seniors told Fields that they now feel safe and secure knowing that they have a place to go to during a power outage. The pastor even heard from the children of the elders who live out of state; they told her they feel better knowing their folks have a safe place to go. "We should be home base to our community," Fields said. "Everyone should know that it doesn't matter what their faith position is; they can come to us to be safe and warm and secure. We are a community church and are here for everyone. So it was great seeing that the whole community was supporting us." "The Warming Station has not yet been officially used and we hope we never have to use it," said Fields. "We hope that nobody ever loses power again, but if they do, if it's only one person we help out, we have done our job and it was worth it." In addition to opening the parish hall when the temperature dips, the church also hosts workshops on disaster preparedness for the community throughout the year. Fields is hoping other churches in the area become warming stations as well, so they can set up a small network for the community. "I think it's important to reach out to and help others whenever possible," said Fields. "It is what the commandment 'love your neighbor' is all about. We can talk about it, sure; but we need to live it." Rev. Fields can be reached at the church office at (508) 548-5269 | Email:waquoitucc@comcast.net. Editor's Note: FEMA offers a guide to help prepare for power loss. This is among a growing number of resources you can find on our MACUCC Disaster Resource Team website, for individuals and churches to prepare for the challenges of New England weather and natural disasters.